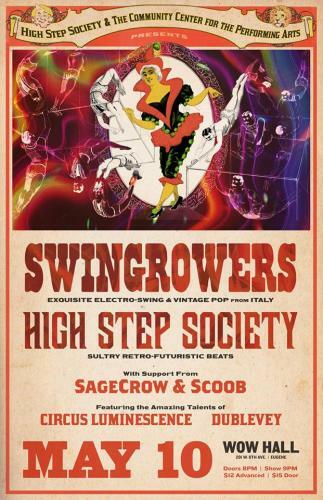 High Step Society welcomes the celebrated electro-swing group Swingrowers all the way from Italy! This one special night will showcase the retro-futuristic sounds produced by these kindred groups from both sides of the pond. The effect is sure to be a dance party of epic proportions. High Step has also recruited a host of spectacular circus performers and dancers to bring the WOW Hall under the Big Top for a wild night of electro-circus fun. Swingrowers, a band formed in 2011 and now a full-fledged star of the electro-swing genre, combines the freshness of electronic music with the warm influences of swing, jazz and the sounds of the past. With three albums, more than 20 million views on Youtube and a series of captivating singles and remixes, the band is one of the most enduring and sought after in the world retro scene. The Swingrowers have brought their explosive live show to the stages all over the world, from the United States to Japan (with two sold out at the Blue Note in Tokyo), traveling as far as India, and have supported artists such as Parov Stelar and Caravan Palace. 2018 saw the release of their third album OUTSIDEIN and sees the band continuing their non-stop live touring. When the honeyed tones of The Jazz Age meld with hottest beat drops of the new millennium, you get High Step Society’s elixir of live Electro Swing. Grandma remembers when she listened to jazz giants on the old Victrola. Grandkids feel the bass beats deep in their chest cavity. Merging dance music from our past with sounds for the future, High Step Society features a shimmering horn section that soars over syncopated high hats and rat-a-tat snare. The kids in the band are electronic music producers as well as educated jazz musicians. Audaciously sophisticated, High Step Society is rethinking jazz with unorthodox arrangements, and bringing a touch of elegance to electronic music. Formed in 2015, they have been playing festivals and packing dance halls across the Northwest ever since.